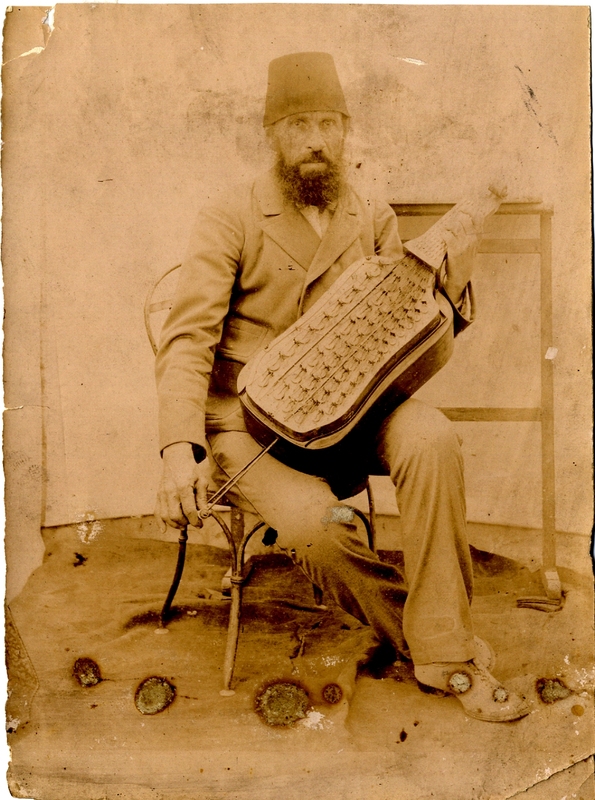 Benno Häupl from Riga (Latvia) sent me this weird and no doubt very rare picture of what looks like an inhabitant of the Ottoman Empire holding or playing a so-called mélophone. I am sending you attached a photo for your webpage. "Unusual harmonica played by a Turk/Greek/Armenian, probably Istanbul, 1860-70". I acquired it last year in Istanbul. Nobody in Galipdede Caddesi or at the conservatory could tell me what it was. They had never seen such an instrument. I found out by chance when I reasearched about Karl Oriwohl who was an old man when I was still living in Berlin. I met him about a dozen times. He used to work for the Berlin "Musikinstrumenten-Museum" and had a private collection of several hundred harmonicas, melodeons, bandonions - from the very earliest ones to the 1950s. When I could not reach him on the phone for a stretch of time, I asked Google and found a website about his collection. There I found - about a month ago - that the instrument on this early Istanbul photo is actually a Mélophone, invented in France around 1830 and played until about 1870 when it vanished. To this day only 6 instruments seem to have have survived (in museums). You will find details about the Melophon only on German Wikipedia (not the English or French ones) Be sure to check out the links there, because it shows how that beast was played: buttons on top of the neck for the notes, and a push-pull handle at the bottom to pump the air. While the air is pumped out in one bellows, it is sucked in into the other one.